Planning a trip to Ibiza? Then our gay Ibiza island guide page can help you make the most out of your visit. 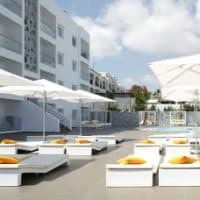 Within the Spanish Balearic island group in the Mediterranean is a lush, green little gem with a big reputation for a club and party scene like no other. Welcome to Ibiza. Ibiza has attracted gay and straight fun-seeking summer holiday makers for decades. It also attracts a very different crowd of both gay and straight visitors who enjoy the island’s beautiful hidden coves, ancient villages and some of Europe’s most stunning holiday villas which dot the landscape throughout the north of the island. Gay party animals simply need to orientate between two key locations. During the day, head to Playa Es Cavallet,Ibiza’s gay beach. By night, sample the nightlife in Ibiza Town (where the vast majority of gay visitors stay). The only deviation is to experience one of the gay parties hosted by the islands legendary super clubs, which are in different locations around the south of the island. 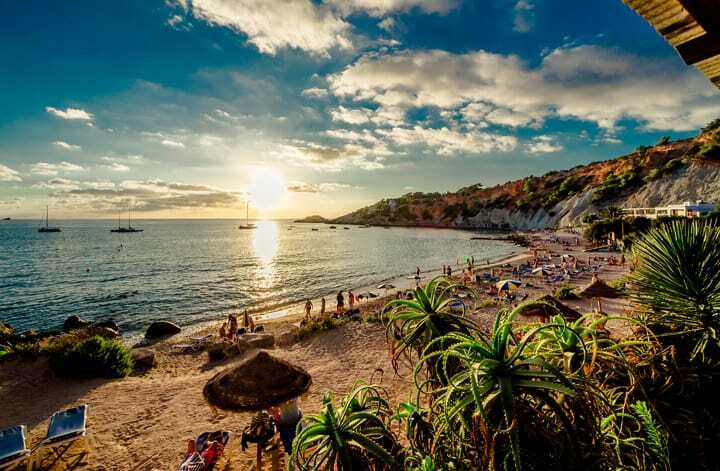 Ibiza is served by numerous charter flights from the likes of Thomas Cook and First Choice and most of Europe’s low cost airlines including EasyJet, Monarch and RyanAir. Regular scheduled flights are available from British Airways, Air Berlin and Iberia. If you are travelling from outside Europe, you will need to connect at a mainland European hub airport such as Madrid, Barcelona, London or Berlin. A taxi from the airport to Ibiza Town will cost around €20. The Route 10 bus departs every 30 minutes or so and costs €3.50. There are ferry services from mainland Spain. Barcelona and Valencia have year round sailings with higher frequency options in the main holiday season. For many gay visitors to Ibiza, getting around amounts to little more than the daily trek from Ibiza town to Es Cavallet beach. You just need to decide on your mode of transport as its too far to walk. Your best options are to take the local bus or hire a scooter, or car (read more about this below). For the bus, you will need plenty of patience as the queues are very long at peak times and it’s a twenty minute walk to Es Cavallet Beach from the bus stop (single bus fare is €2.90). Scooter riders need to be aware of the dangers, especially from the many other fun seeking, inexperienced scooter riders filling the busy road from beach to town. Accidents, bumps and scrapes are far too common. When you are tempted to sample one of Ibiza’s super clubs, a local taxi is your best option to get there and back safely. To explore the island and take in the beautiful and less developed north, its fishing villages, local craft and produce markets and beautiful secluded little sandy bays, then the best option is to hire a car. The road network is good, and the traffic quickly disappears once you leave Ibiza Town. 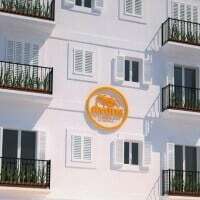 For our list of recommended hotels in Ibiza Town near the gay nightlife, visit our Gay Ibiza Hotels page. 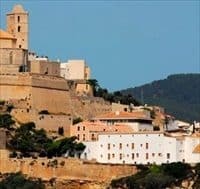 Ibiza Town will grab your attention as the centre of the island’s night time gay scene, with numerous bars and small clubs dotted around its quaint cobbled streets and alleys. 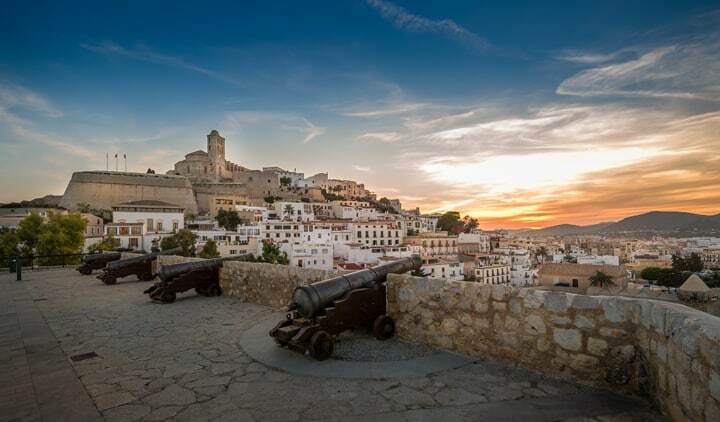 It is also a UNESCO heritage listed fortified old town that’s well worth exploring, all the way up to the Castle (Dalt Villa) atop a rocky outcrop, commanding fine views down over the town and out over the Mediterranean. Ibiza has one hundred miles of coastline and fifty beaches, so if you can tear yourself away from Es Cavallet, even just for one day, your efforts will be well rewarded. Avoid San Antonio completely (the centre of the straight party crowd scene) and head northeast to discover a completely different, tranquil and beautiful side to the island. Stop off at the charming villages of St Miguel and Sant Joan de Labritja before heading back down to Ibiza Town. Another great day trip is to visit Ibiza’s sister island, Formentera, a one-hour boat ride away, and easily reached by ferry from Ibiza Town. Once there, you can hire a bicycle or scooter to explore and really appreciate the beauty and peaceful tranquility which this island is famous for. There is a good range of holiday accommodation on the island too if one day of peace and quiet leaves you wanting more. Ibiza’s summer season runs from late May to late September. You can be lucky with warm and sunny weather by chancing a trip in April, although many of gay venues are only open during the high season. August is particularly busy and a popular “add-on” beach destination for those who visit Barcelona for the Circuit Festival. May, June and September are great times to visit. 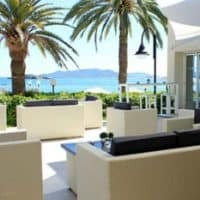 Chances are you will have day after day of beautiful sunshine and the whole scene, from the beach to the bars, has a more relaxed and chilled out vibe. You will still meet plenty of other gay travellers, but generally, accommodation, flights and car rental prices are cheaper. Ibiza is part of Spain and within the European Schengen visa area. If travelling from outside Europe, check to see if you require a Schengen visa. Spain is a member of the Eurozone. Cash dispensers are widely available. You may be asked for photo ID if paying with a credit or debit card in a shop. The Playa Es Cavallet gay beach is 5km from Ibiza Town. You can catch a (often crowded) bus and walk the last kilometer, rent a car or motor scooter or book an (expensive) taxi. Our preferred option is to hire a car. However, parking at the beach can be a hassle during peak season, so best arrive before 1pm. Many hotels offer parking facilities. There are a number of relatively cheap public car parks in Ibiza Town and some unrestricted street parking. Blue lined zones are time limited pay and display areas. Yellow lined zones mean no parking. A compact model is definitely the best option. There is a modern dual carriage way from the airport to Ibiza Town. Most other roads are well maintained, although some can be quite narrow. There are some excellent scenic routes around the island and some great beaches that can only be explored by car. Cars are driven on the right hand side of the road. Seat beats are compulsory for both the front and back passengers. Using a mobile or handheld GPS device whilst driving is illegal in Spain. Do not overtake or cross a single white line in the middle of the road. Keep your driving license on you while driving.